France's Senate has overwhelmingly approved a bill that would ban wearing the Islamic full veil in public. The proposed measure was already backed by the lower house of parliament, the National Assembly, in July. The ban will come into force in six months' time if it is not overturned by constitutional judges. 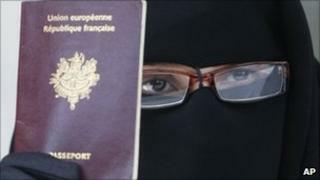 The ban has strong public support, but critics point out that only a tiny minority of French Muslims wear the full veil. President Nicolas Sarkozy has backed the ban as part of a wider debate on French identity but opponents say the government is pandering to far-right voters. Spain and Belgium are debating similar legislation, and with such large-scale immigration in the past 20 or 30 years, identity has become a popular theme across Europe, correspondents say. On Tuesday, the Senate voted 246 to 1 in favour of the bill. It will be now sent immediately to France's Constitutional Council watchdog, which has a month to confirm its legality. Another challenge is possible at the European Court of Human Rights in Strasbourg, where decisions are binding. There are estimated to be only about 2,000 women wearing the full veil in France. The bill makes it illegal to wear garments such as the niqab or burka, which incorporate a full-face veil, anywhere in public. The niqab and burka are widely seen in France as threats to women's rights and the secular nature of the state. The bill is also seen as a touchstone for the Mr Sarkozy administration's policy of integration. It is grappling with disaffected immigrant communities as it seeks to prevent a repeat of the mass unrest of 2005 on run-down French housing estates. In March, the Council of State, France's highest administrative body, warned that the law could be found unconstitutional.